Product code: ES7865 Categories: Sold Items, Sold Rings. 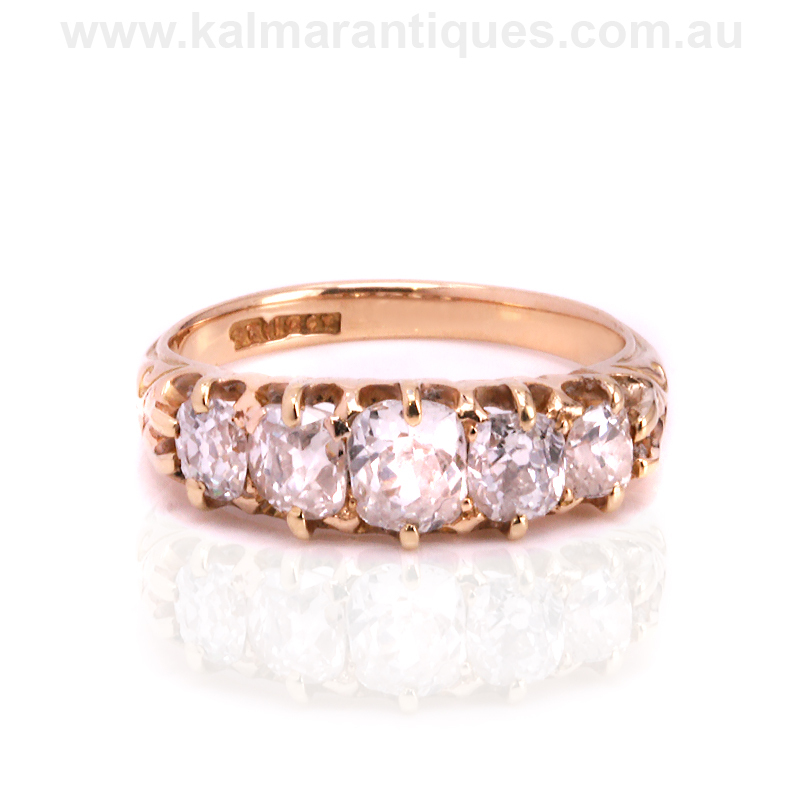 There is something so special about a genuine antique ring on your finger which is made even more special when it is an antique diamond engagement ring set with mine cut diamonds such as this one here. Antique mine cut diamonds are also known as “cushion cut diamonds” thanks to there somewhat resemblance in shape to a cushion and were first cut at the start of the 18th Century and remained the main cut of diamonds for over a century. So sought after today modern versions are being cut today, however nothing beats the genuine mine cut diamond hand cut over a century ago. The fives diamonds total an impressive 1.54 carats and are G in colour and Vs to Si in clarity. The diamonds graduate in size so elegantly across the finger and measures 6.4mm wide at the centre and 18.9mm across, and this ring will look so good on its own or along side a wedding ring. Antique diamond engagement rings are made all the more special in knowing that there is only one of each as they were all hand made and set with genuine antique diamonds. This antique diamond engagement ring is set with mine cut diamonds that total 1.54 carats weight.